So my work computer fried itself on Monday and I am displaced in my office. My guess is the power source but still waiting on a final diagnosis. If that wasn’t enough the server decided to act up and corrupt a bunch of files at the same time. Some I’ve figured out, others completely stumped. While technology makes us more organized and life easier, especially in my world, it can also be one’s worse nightmare when it decides to become fussy. Bringing my office, which was already in chaos and almost at a standstill due to employee overturn including my departure very soon, to a total standstill. Technology helps us not to re-create the wheel and one feels it the most when one must re-create the will. At the same time we are facing technology challenges, I am also working to prep the office to go paperless as our state court system also moves to a paperless system. A paperless system addresses a number of needs 1) organize information into a system that is easy and functional 2) become more time efficient by reducing or streamlining steps 3) cut the amount of paper 4) save physical space 5) speed up delivery time. I have worked in offices before that were moving towards a paperless system, starting back over 7 years ago, but my field is very difficult to break inertia and bring about change. It happens slowly and usually only when we are forced to adapt or die. One of the biggest obstacles to a paperless, or perhaps I should call it a paper minimalist, office happens to be that many employees do not have a firm enough grasp on how to use technology to understand how their job would be made easier by the change. It is almost to the point that new employees have to know more about technology then just how to use word or basic internet searchs. Thus, I spent most of yesterday afternoon working with two members of my office to carry out a paperless system for their unit. Starting with figuring out what was/wasn’t essential or required for the office to keep, the current computer software they were using and its functionality, and then brainstorming with them to create a file tree and procedures for how the entire process should work from the opening of a file to the closing and storing of the file at the end of the process. Then back to the office to actually fiddle with their software and figure out ways to reduce steps, including reduction of printing and scanning to put documents into the new system. Within 30 minutes, I had identified where the software was storing important documents that needed to be copied into the file tree and how to transfer files, originating outside of the program or sent to us, directly into the program without ever generate a single piece of actual paper. While the office has a LONG way to go, it is a positive first step in the right direction. At this point, it is simply getting people into a new routine of doing things that may be the biggest hurdle to overcome. With these small accomplishments I am excited to see what I can do with our Ipad and integrating it into my professional life to increase efficiency and thus allow a larger work load. Entering the world of Stephanie Laurens is simply a pleasure. As I previously posted, I adore serial novels and Stephanie Laurens is certainly the Queen of them. Her Bastion, Cysnters, and Black Cobra series are utterly interrelated and each series (except the Cysnters) has the same mysterious villain which each h/h must face. During the course of their romance, they discover more information such that the mystery is resolved at the end of the series. For the Bastian Club series, it was a mysterious spy, for the Black Cobra, a notorious gang wrecking havoc in India. The Cynsters series revolves around the offspring of one family (all brothers and cousins) who have a tendency of always finding trouble. The novels expand to include sisters, a few friends, and family members of those that married into the family. From a murderous cousin, to horse race fixing it is an intricate world of domineering men and the self-confident women who know how to put them in their place. The latest book in her world is Viscount Breckenridge to the Rescue. It is a new series dealing with the younger sisters of Gabriel (book 5) and Lucifer (book 6). The premise of the story is like that of the Bastian and Black Cobra series, a villain pulling the strings and each book drops hints to whom the villain is and why they are, in this case, kidnapping the sisters. Anyone who read Ms. Laurens Black Cobra series, will instantly see the plot similarities. The story revolves around the h/h going from point a to point b for a good part of the book. Once at point B, the book deviates from the Black Cobra series and it is the inner workings of the h/h (and a mad bull) that push the final admissions of love. While the novel does carry some air of danger, it is not along the lines of many of her earlier novels. One never gets the feeling that either the h/h are in any true danger from the villain. In fact, the villain is not a true villain in the typical sense, especially if you try to compare him to those in the black cobra series. I was left with the impression that the bad guy could very easily step into a hero role in somewhere in her world, even by the end of this series. I am very interested to see where the next book in the series In Pursuit of Eliza Cynster takes this series and which of the old characters I will get another peek into their lives. Thankfully, I only have to wait about 10 more days. That is really the bad thing about loving these type of novels. One generally has to wait sometimes a month, sometimes a year or more for the next installment and patience is not one of my virtues. It is possible? How you ask: poor lighting and very very tiny holes! 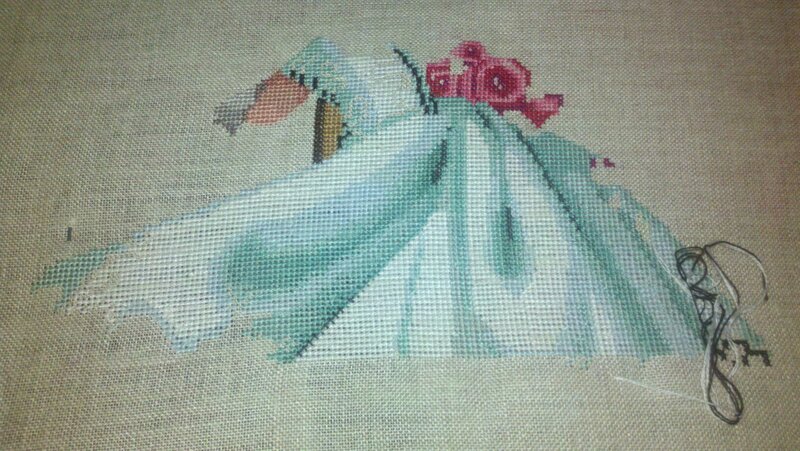 When I am not reading, one of my other past times is counted cross stitching. It is about the only creative type thing I do successfully (I really doubt I have a creative bone in my body). Cross stitching is straightforward, linear and rational. It makes a lot of sense to my mind and I can easily see the patterns, enough to pick up a project years later, and easily find where I left off and automatically correcting all my past mistakes. The first is a Mirabilia pattern, The Fairy Moon. The second The Queen of Fairies by Passione Ricamo. I adore both pattern makers and its sad that I know I will never ever be able to make all the ones I wish to. The are both done on 28 to 32 count cloth. I ended up hand dying The Queen of Fairies cloth because I could not find the color I wanted. Sadly, I think it needed a shade or two lighter pink to really make the picture come alive. 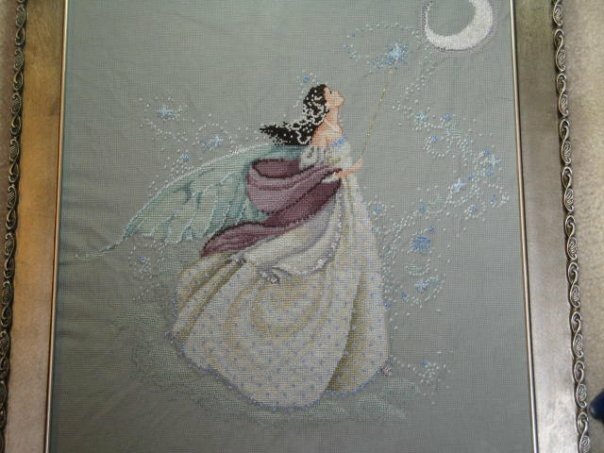 The Fairy Moon includes linen dmc thread and lots of mill hill bead work. 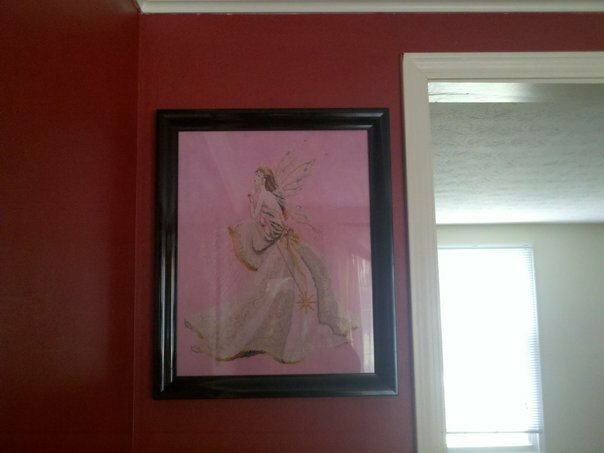 I chose to use Rainbow Gallery Silk Splendor for the skin tones of The Queen of Fairies. Which leads me to my current project, another Mirabilia Pattern Sabrina. I’ve just started her and she’s moving along nicely. She is on 28 count linen cloth. I am again using the silk thread for her skin and am also working with Cannon Collection Waterlillies silk thread for the first time. It is good thing this pattern is moving along because I just checked the Mirabilia website and the released a new pattern, Elizabeth, which I am going to have to buy. The only question is will I do her next after Sabrina, or one of the other two patterns I have, or finish one I have started years ago and just never got done. I have always been in love with serials. Starting with comics as a child, I love being completely immersed into a circle of people. Serial novels give readers the opportunity to meet all the characters in-depth, but also to find out more about past characters. A majority of the books I read are part of a series. I find a certain satisfaction in them. But sometimes it also leads to disappointment, especially when a characters story does not come out like you wished it would. This was one problem I had with the last book in Elizabeth Boyle’s Bachelor Chronicles series, Memoirs of a Scandalous Red Dress. I HATED this book. If my copy was a paperback it would have gotten tossed across the room (but since it was a kindle e-book, I thought better of it). I didn’t hate the book due to anything being wrong with the book except that it was not the story I wanted for the h/h. I was extremely bitter because this couple was my favorite of the three. Needless to say, I am extremely pleased that her latest series, an offshoot of the previous one, made no mention of this heroine, as it would simply taint the new series (which I thoroughly enjoyed) with my disappointment of that book. Ecstasy Wears Emeralds . After reading the first book in this series, Revenge Wears Rubies, I couldn’t believe I had to wait so long for the next book to come out. The background starts in India, wear 6 men are held captive in a dungeon, escape, taking with them a fortune in jewels (hence the reference to a specific gem in each book title, one for each man – Rubies, Sapphires, Emeralds, Diamonds, Pearls and Opals). Each man has to adjust to returning to society and towards the end of each book faces a nameless villain who wants something they supposedly brought back from India. The villain plays a minor role in each book and appears in the very last part of the book, right as the hero realizes he’s fallen in love and has to decide whether to push away the heroine or keep her close, to protect her. This twist is the driving force to bring about what the couple has fought all along, they are completely enamored with each other. And oh how they have fought in each book. The couples are their own antagonists, which really allows the reader to become emotionally involved with the characters. In this book, the fight is over the heroine wanting to study medicine under Dr. West, which of course he knows isn’t possible, despite how talented she is, and his attempts to burn her out. Throw in some past secrets, assumptions, and one infatuated bribeable young man and Renee Bernard has another successful book in this series. Again I am left waiting for months for the next installment and which of the remaining three will be next.